Just a few weeks ago we came together as a nation to decide our future as we voted for the individuals who will lead us in the years to come. A few days later, we paused to honor and remember the efforts of the men and women who have fought to preserve our right to vote, and our many other freedoms. Now, as we celebrate the Thanksgiving holiday, it’s a time to give thanks for the many blessings we have as a people and a nation. Unlike many other nations, we do have free and fair elections where the decisions of folks from all walks of life are counted equally. Even if you’re unhappy with the outcome of the elections, you have to admire a system that allowed all of our voices to be heard through the voting process. Even better, we are able to do this is in a nation where equality and opportunity are real things. We are fortunate to live in a land where dreams can come true through hard work and determination, and where the American Dream is a reality for those who pursue it. And on a day where we give thanks, it is important to keep in our hearts and prayers the many men and women who continue to serve and protect our great nation. So many of them are away from home, and apart from those they love during a time of year when being with family means so much. They have put love of country above all, and for that we must give them our sincere thanks and gratitude. It’s also during this time of the year when we should look beyond our own trials and tribulations, and ask what we can do to help those around us in need. As you give thanks with your family, I urge you to take the time to start this discussion. Many are blessed to have plenty, while many others do not. It is during the holiday season that a donation to the local food bank or the Salvation Army can mean so much for a family that otherwise would go without. On a personal note, let me also say that I am extremely thankful to continue to have the privilege of serving as your state representative. It has been an honor and a blessing and an experience that has forever altered my life in a profoundly positive way. Thank you for giving me this opportunity to serve as your voice in the halls of government, and may you have a blessed Thanksgiving. I would like to introduce everyone to our new Legislative Aide, Tyler Hobbs. Tyler is from Springfield, MO, a graduate of Ozarks Technical Community College and Missouri State, where he studied political science. Tyler is also in the United States Army Reserves where he has served the past 10 years as a Civil Affairs Sergeant. His experiences include a combat deployment to Baghdad, Iraq, a mission to the Republic of Georgia, as well as numerous of leadership activities through the Army. During his years at Missouri State, he interned and then worked for Congressman Billy Long in Southwest MO. 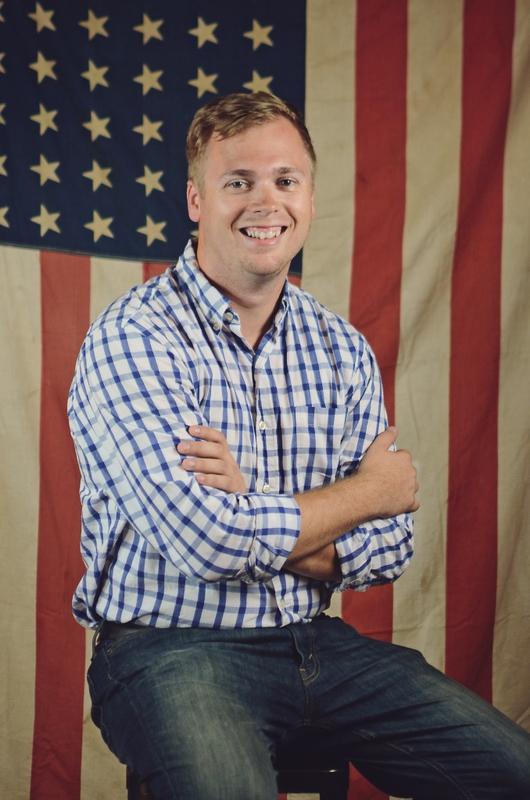 Before coming to us, he most recently has been working for the College Republican National Committee recruiting college students for conservative causes. Tyler has already proven to be a valuable asset in our office and I look forward to having him out in the district to meet folks soon! Citizens from all walks of life turned out to cast their votes and make their voices heard on Election Day. It was an important reminder of the freedoms that have been fought for and defended throughout the centuries by the many brave men and women who have rightfully earned the title of hero. This year I had the pleasure of speaking to the students at Charleston High School on Veterans Day. I think it is so very important that our children grow up understanding that our freedoms have not been handed to us. They have been earned by those who have served. Each year, we pause as a nation on Veterans Day to honor those who have put their love of country above all else. It’s a time to thank those who have risked life and limb to ensure Americans can vote on Election Day. It’s a time to salute those who have fought to protect us from the scourge of tyranny and injustice. It has been said many times before, but it was reminded again on this past Veterans Day; we owe these brave souls a debt of gratitude that can never be fully repaid. That is why it’s imperative that our gratitude and respect for their service be sincere and abundant. However, even with the commitment so many of us make to honor their heroism, many of our veterans continue to live without any sort of recognition of their selfless service. Each night here in this country there are more than 50,000 homeless veterans sleeping wherever they can find shelter. In fact, veterans make up more than 55 percent of the homeless individuals on our streets. Consider too that the suicide rate among those who have served is 50 percent higher than those who have not. And even here in Missouri, where we make a concerted effort to do all we can for our veterans, we still see approximately 2,000 veterans on a waiting list to receive care at one of our seven veterans homes. We must do better. Missouri has been trying to increase the help given to more than 490,000 who call our state home. Our economy is boosted by the nearly 50,000 veteran-owned businesses within our borders. Our efforts to invest in our veterans through job training and new educational opportunities saw more than 14,000 veterans go back to school and receive more than $55 million in assistance in 2014. Missouri has also worked to help veterans overcome substance abuse problems by creating Veterans Treatment Courts. And thanks to these efforts, not only have thousands received the training they need to get better, higher-paying jobs, but we’ve also seen the suicide rate among veterans in our state drop by 37 percent over the last few years. These are all positive signs but there is always more we can and should do. That can be as simple as expressing your gratitude by saying thank you to someone you know who has served, or as involved as donating your time or money to charitable causes that work with our veterans. And for the legislature, it means continuing to find policy solutions for the issues faced by our veterans. We must all acknowledge that we wouldn't have had the luxury of voting this month had it not been for our veterans. We should all make the promise to treat our veterans with the respect they have earned. Let us vow to do that not just on one day each year, but on each and every day. Their extraordinary accomplishments have created an extraordinary debt that we must consistently work to repay. Their sacrifices have given us the nation we love, and their commitment to service has protected the freedoms we all hold so dear. For this and for all they have done, we must always be grateful. Headed into Election Day, political experts and polling data predicted many of Missouri’s races would go down to the wire with Republicans favored in some contests and Democrats in others. After the dust settled late Tuesday night, the pollsters and pundits were proven wrong as Republicans surged to convincing victories in all the contests for statewide office, and the House and Senate maintained veto proof super majorities. Missouri is now set to have a Republican governor for the first time since 2009, and Republicans will now hold the offices of Secretary of State, State Treasurer, Attorney General, and continue to hold the office of Lieutenant Governor. The only statewide office still held by a Democrat is State Auditor, which was not on the ballot in 2016 but will be up again for re-election in 2018. When the House convenes for the 2017 session in January, the breakdown will be 117 Republicans to 46 Democrats. The margin gives Republicans 8 more votes than necessary to override a gubernatorial veto. In the Senate, Republicans will continue to have a veto proof majority as they will hold 24 of the 34 seats. However, with a Republican now set to hold the governor’s office, the legislature’s historic number of veto overrides in recent years will likely come to a halt as the legislative and executive branches instead work together on shared priorities. When Tuesday began, Missourians had a number of important ballot initiatives to consider ranging in subject matter from enacting limits on campaign contributions to increasing the tax on cigarettes. As Tuesday night came to a close, voters had decided to reject both proposed cigarette tax increases, but support the other measures on the ballot. Below is a more detailed look at the changes to the state constitution voters decided to enact. More than 80 percent of Missouri voters chose to support Constitutional Amendment 1. The ballot measure will continue the state’s one-tenth of one percent sales/use tax that is used to support soil and water conservation, and for state parks and historic sites. The tax was first approved by voters in 1984, and then again in 1988, 1996, and 2006. The renewal of the tax is re-submitted to voters every 10 years under the state constitution. The tax generates approximately $90 million each year for soil and water conservation, and for the operation of the state park system. Since the tax was last approved by voters in 2006, more than 61,000 conservation practices have been implemented through $348 million in cost-share grant projects. In the past, the funds have helped prevent millions of tons of soil from eroding into Missouri’s rivers and lakes. Funding is also utilized to maintain and improve Missouri’s 88 parks and historic sites. Nearly 70 percent of Missouri voters decided the state should re-establish campaign contribution limits. The state previously had limits in place that were approved by voters in 1994. The limits were repealed by the General Assembly in 2008. Now, with the voters approving Constitutional Amendment 2, Missouri is set to re-implement limits. The change to the state constitution will limit contributions to individual candidates to $2,600 per election. It will limit contributions to political parties to $25,000 each election. The amendment is also designed to prevent individuals and entities from intentionally concealing the source of the contributions. Additionally, the amendment will create a complaint process and penalties for violating its requirements. Constitutional Amendment 4 received 57 percent of the vote and is now set to go into effect to prohibit new state or local sales or use taxes on services. In effect, the proposal will ensure that governmental entities do not create new taxes on services such as a haircut or a repair service for a vehicle. In recent years states like North Carolina and Washington have enacted taxes on services. North Carolina’s new tax extends to services like auto repair, sign painting, and some heating and plumbing work. States have enacted the new taxes in an effort to make up for lagging revenues from lower sales tax collections. Amendment 4 will ensure similar taxes cannot be put into place in Missouri. With more than 63 percent of the vote, Constitutional Amendment 6 received strong support from Missouri voters who want to see the state implement a system of voter identification. Because of the passage to the state constitution, and legislation approved by the Missouri General Assembly, Missouri voters will now need to show a valid form of photo identification before voting. Valid forms of identification will include photo IDs issued by the state, the federal government or the military. The proposal also will require the state to pay for individuals to obtain a valid ID if they do not have one, or to obtain documents necessary for an ID. Additionally, the new law contains a provision that will allow a voter without a valid photo ID to vote with a regular ballot by showing another form of identification. Supporters of the voter identification system say it is important to protect the integrity of the elections system. They say requiring a photo ID will prevent voter fraud at the polling place by requiring each voter to prove that they are who they say they are. They also note the provisions of the new law make it easy for anyone without an ID to obtain one. Rep. Shelley Taylor and I had a fun time visiting The Christian Acadamy last week. We put on a mock committee with the kids allowing them to argue for, and against, a student's bill. The bill was to allow french fries to be sold every day at lunch. Very few came out in opposition!